Keep in mind that when these Prophecies were written, there were no explosives, not even a firecracker. But they are foretelling of a precise generation, in which we now live and can see those things active and being used, as if the death and destruction of others mean nothing. 8 Now Cain talked with Abel his brother; and it came to pass, when they were spread abroad, that Cainrose against Abel his brother and killed him. 14 Surely You have driven me out this day from the face of the ground; I shall not be seen by Your Face. I shall be a fugitive and a vagabond on the earth, for there shall be continual war, vengeance, andretaliation. 11 Samuyl said; This is how the king you desire to reign over you will behave: He will take your sons and appoint some of them to serve with his chariots—some will drive his chariot horses, and others will run in front of his chariots. Please compare to this present prophesied generation, which is the time of the Two Witnesses, the anger shown by Cain in Genesis 4:6. 17 For the lusts of the flesh are against the Spirit of Yahweh, and the Spirit of Yahweh is against the lusts of the flesh; for the one opposes the other. So, be mindful, and do not do just anything you desire to do. He will appoint captains for his army__captains over thousands and captains over hundreds. Your sonswill plow his ground, others will bring in his harvest, and others will manufacture weapons of war and equipment for his chariots. The three colors given in Revelation 9:17 are the same three colors that make up the nuclear mushroom cloud that results from the explosion of a nuclear or atomic bomb. For more information concerning these colors of the mushroom cloud read pages 125-126 of The Mark of the Beast, Volume 2 or pages 125-127 ofBirth of the Nuclear Baby. Iniquity is what we see in all of the religions and governments of the world today. None teach or seek Yahweh’s Kingdom and His Righteousness, except the Last Days’ established House of Yahweh. According to the Greek dictionary in Strong’s Exhaustive Concordance, the word iniquity is word #458 from word #459, and means: not subject to the Laws; that is, doing away with the Laws. Notice what this spirit of iniquity brings. You can read more about the increase of computer knowledge, which started in 1934, in our 2013 issues ofThe House of Yahweh Newsletter and The Prophetic Word magazine. As to whether or not the Prophecies are True, you can plainly see, without doubt, they are absolutely true. The Name of the Savior, Yahshua Messiah, was removed from Scripture and replaced with the names of two Gods from Egypt, and the title lord or ‘the’ lord. Call, write, or email us for information. Yahshua Messiah shows that those who worship Gods (Gen. 3:5) and teach the evil of manufacturing weapons, do not know the way to Peace. Nor will they accept Yahshua’s Instructions that would bring them both Peace and Salvation. Even after a third part of men is killed in and around the great River Euphrates by nuclear wars in this present prophesied generation, they still will not repent. Prophecy shows that four-fifths of the earth’s population will be killed before they finally destroy all their means of manufacturing and using weapons of fast delivery mass destruction. 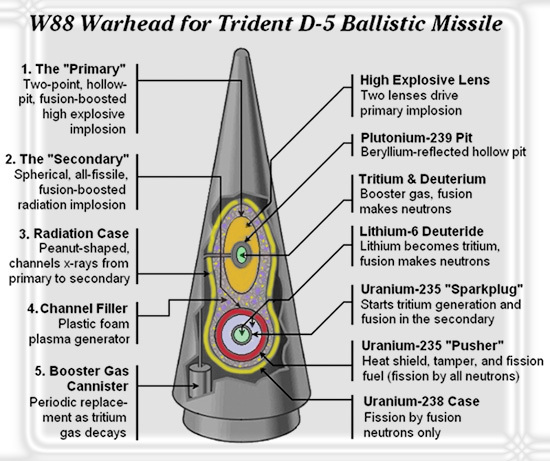 The W88 is over 30 times more destructive than the bomb which wiped out Hiroshima. …US and Russia who keep 1,800 weapons on high alert atop long-range ballistic missiles that are ready to launch 5 to 15 minutes after receiving an order! The world is filled today with preachers that are teaching their subjects to sin, even claiming that the Savior and His twelve Disciples taught the world to sin. Satan is very subtle. She gives those who love darkness (evil) what they want to hear. And this generation wants to hear it more than any other generation before them; because they have been taught to sin from the day they were born. It comes into the hospitals, the homes, the schools and even the churches. It comes from television, radio, the Internet, schools, churches, and homes, due to iniquity increasing. Yes, Truth; the Laws, is suppressed; and he who departs from evil; upholds the Laws, is accounted as mad; makes himself a prey! Yahweh saw this, and it displeased Him that there was no justice in the Last Days. 17 Do not even think that I have come to destroy the Law or the Prophets; I have not come to destroy them,but to establish them. In this present generation, the Tribulation is building. So is the Message of the Kingdom of Yahweh. Yahweh’s Righteousness is going out to all the world. In the beginning, Yahweh offered mankind the opportunity to become an eternal member of The House of Yahweh. The House of Yahweh is forever, as we see in the famous 23rd Psalm. To turn a person from all of the deception going on in this generation is virtually impossible. But Yahweh had a Plan from the beginning and His Plan is almost complete. Let man go his own way, Yahweh said to His Prophet Samuyl, and I will prove to him what following Satan and the other Gods (demons), will bring. Warn them, but let them go their own way or let them choose the Kingdom of Yahweh and Yahweh’s Righteousness in obedience to Life. Those who are left alive will be those who have repented and converted to practicing Yahweh’s Laws and will be protected by Yahweh, because this Last Days’ House of Yahweh is forever. Remember, the gates of hell will not prevail against this House. Their High Priest is Yahshua. Notice what the High Priest Yahshua is over—the Work, the Teaching. 19 O Yahweh, my strength and my fortress, my refuge in the day of affliction, the nations will come to You from the ends of the earth, and will say: Surely our fathers have inherited nothing but lies and vanity;worthless, powerless Gods (elohim), of no use at all! 14 I have also seen in the prophets of Yerusalem a horrible thing__they commit adultery and walk in lies;they turn from Yahweh and follow after the Gods (elohim)! They also strengthen the hands of evildoers, so that no one turns back from his wickedness. All of them are like Sodom to Me, and her inhabitants are like Gomorrah. Remember, the House of Yahweh was also prophesied to be established in this present prophesied generation. It was established, and It is doing exactly what Yahweh said that It would do.